At a time when Yorubas have distanced themselves from their traditional faith, a number of Americans are embracing it. ADEWALE OSHODI tells the story of four American Ifa faithful who have found peace in the religion, while urging the real custodians of the tradition not to abandon the faith. The saying that we don’t value what we have until we lose it is applicable to the Yoruba people of South West Nigeria and Benin Republic, who are fast losing their traditional religion, and more surprising is the fact that Americans are now accepting what these descendants of Oduduwa view as a fetish culture. Today in Yorubaland, a large number of people profess Christianity and Islam, while a tiny minority can only identify with the Ifa religion. However, for this loss, the Ifa religion has gained new adherents. A number of them can be found in the United States. One of such is Chief Akinkugbe Karade, an African-American, who has been professing the Ifa religion for the past 16 years. Chief Karade did not just decide that he was going to become an Ifa adherent; rather, he said in the course of finding spiritual satisfaction, he found the Ifa religion. “I found my way to Ifa after a 16-year search for my religious truth that took me through Christianity, Islam, Buddhism and finally to Ifa. “I was initiated in East Orange, New Jersey by Chief Ifa Karade in 1997. I was initiated again in Nigeria by Chief Fayemi Fakayode in 2010,” Chief Karade said. Today, Chief Akinkugbe Karade is the chief priest and founder of Ile Imole Ifa, Inc. in East Orange, New Jersey, “and we have served the community since 2002 and continue to do so till this day,” Karade, who has also authored the book, Path to Priesthood: The Making of an African Priest in an American World, said. It is not often easy getting the support of one’s family when one wants to make certain decisions in life, especially one that is as sensitive as religion, but Karade explained that his family has been supportive of his choice in life. “My family was very supportive of me and my journey, although they didn’t really understand it. My mother was always encouraging all of her children to follow their dreams and make them come true. “My experience in Ifa has been one of great self discovery. In my journey in Ifa, I have learned so much about myself and my lineage that I can almost make a book of it. I can truly say that Ifa has changed my life. I am definitely fulfilled because Ifa has given me the opportunity to actualise the path of my ancestors. “As far as what I feel, I feel a very real connection to Orunmila, the egunguns (masquerades) and orisas (gods). A connection that allows my life to be better guided and help others to do the same. I will definitely spend the rest of my life doing just that,” the African-American priest said. Iyanifa Ekundayo Adele Ifamuregun’s story resonates with Karade’s. She said she had been drawn to the issue of religion right from her tender years. “I was drawn at a very young age to religion, philosophy and the question of why we are here on this earth; so by the time I was 12 years old, I had read the Holy Bible several times, the Koran, and also the works of Gautama Buddha. “At that age, I made a commitment to live this life on a spiritual quest to work for God, and my ultimate desire was to be able to heal people, allowing God’s power to move through me and use me; so when I was 15 years old, my first spirit guide came to visit me, and that was how I developed interest in the Yoruba religious tradition, and I started developing until I became an Iyalorisa (priestess). “However, it wasn’t as easy as said; I had lived a long life already at an early age, travelled, had businesses, working in my shrine, but at the same time, my orisa and guides were telling me that what I had learned and practised in terms of my religion, was not quite accurate. “I began to look for answers and found that this was true. Then came a period of six months that I began to take stock of my life, and for some reason, I felt I was going to die. I did not know why, but I was making peace with that. I just felt it in my bones, my ori (god) was telling me so. “So there was a time I asked myself what I have not done yet in my life? And knew I wanted to go to Nigeria and be initiated into Ifa before I die. That was my wish. “So I travelled to Ogun State where I had full initiation, and during the traditional rites, the priests, who knew nothing about me beforehand, quietly told me the story of my life up until that moment, and they told me I had come to Nigeria because I was going to die, and that I knew I was going to die. “I just sat there stunned on that sacred red earth under the trees with the sun shining above and cried. It was the day of my rebirth. They knew everything about me, my hardships, my struggles, everything. I must confess that that initiation was the happiest day of my life, because I cheated death. My ori, Ifa and the good babalawos gave me my victory over death, and it still makes me cry tears of joy thinking back on that day, so it is fitting my name, Ekundayo,” the Iyanifa said. “Today, I am very happy with my life. Of course, there are trials and tribulations, but if God handed everything to us on a silver platter, would we still need to strive and grow as a spiritual being in a human body? 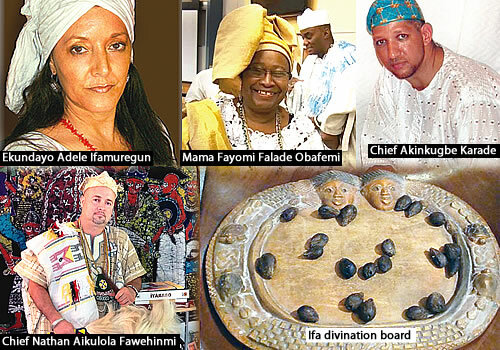 “However, it is painful that the Yoruba people are distancing themselves from Ifa; people in the diaspora are very interested in Ifa; there are many Ifa priests here in the US, in Brazil, Cuba, Venezuela, among others,” the priestess said, while charging the Yoruba people not to lose their faith. Mama Fayomi Falade Aworeni Obafemi, an African-American woman, born 62 years ago in Chicago, Illinois, USA, found the Ifa religion in a different manner entirely; she found it through the sound of drums in 1965. “The sound of drums beating on the Southside of Chicago was not an unusual sound in the context of hearing people playing konga for entertainment in the parks by the lake front of Lake Michigan. 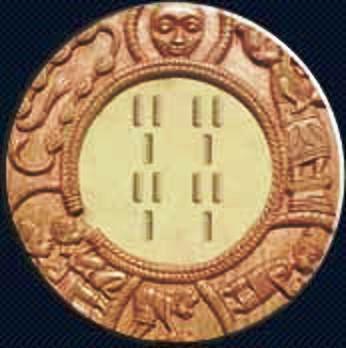 “I began in the tradition of Ifa and Orisa as a 14-year-old child in Chicago in 1965 when there was a great upheaval in world politics. “African-Americans, in the 1940s through the tumultuous 1960s, were fighting for their freedom from oppression from Caucasian-Americans and were leading the charge by civil disobedience. With this in mind, many African-Americans were disregarding and moving away from Christianity of all sects and denominations due to the idea that they did not want to serve a god that did not look like them in appearance. “Many of our people were looking towards Africa as a means of expressing their spiritual and religious philosophies and belief systems. So, I too, found dissatisfaction, not just because of the Christian church protocols and beliefs, but because I had certain spiritual gifts and was ostracised because of those gifts. “Walking down the street, I heard the sound of African bata beats; it was compelling during the turbulent years in the 1960s, and it brought me into the world of Ifa, the Yoruba traditional religion, and I have been a faithful for 48 years now. Mama Fayomi, who has lived in Ghana, as well as in Nigeria, is also an author, a teacher, a religious activist, among others; she practises as a priestess in Phoenix, Arizona. Nathan Aikulola Fawehinmi was born as Nathan Lugo and raised in New York. He is of the Puerto Rican descent, and he started developing interest in traditional religion at a very young age. “As a young person of Puerto Rican descent, I started becoming aware of the alternative spiritual traditions of my heritage, and that included African-based spirituality. Among the most common spiritual traditions outside of Catholicism is Spiritism in Puerto Rico, which is itself a diasporic creation with roots in European Christianity, some aboriginal, and African beliefs and practices. So it was not that difficult for me to settle for the Yoruba traditional religion. “So I can say I simply followed my passion. It was in 1998 that I first travelled to Yoruba land for my traditional rites. In later years, I was also initiated to Oosaala, Ogboni, and Egungun, and the art and healing principle of this culture is making me to practise full-time as a priest. “Today, my entire life has been shaped in a positive way through Orisa and the Ifa literature and divination system. I live modestly yet comfortably. I can be in several countries in the Americas, Africa, and Europe, and I have extended family and a home in each of those places. I live in the tropical climate of Miami Beach, and I continue to grow as a human being in terms of knowledge, character, and unforgettable positive experiences with the other wonderful people on this path,” Fawehinmi, who abandoned university studies to follow Ifa full time, said. “I was an Anthropology and African Studies major, but I didn’t finish my university studies; my study and practice of Ifa was what opened the way for me to learn the Yoruba language and to travel to West Africa. “Of course, my decision lended me the freedom to do exactly what I wanted to do, instead of having to follow the strict guidelines of academia,” Fawehinmi said. My name is John Houston we met back in your home and band back in the 90’s. I would consider it an honor to speak with you again since it has to do with my return to the IFA tradition. I pray that this note finds you and your family in good spirits and good health. Please my name is Emmanuel 31yrs from Ghana and is believe to be a member of Ifa religion: the true religion to divinity. I am interested in the Yoruba-ifa faith. I know nothing, other than I’m drawn to it, for many years now. I have experienced Christianity, also Islam. I need a Ifa priest or priestess, a Yoruba Ifa family/community.